Well, well, well. Here it is, Monday morning already. Honestly, I don’t have much to show you. Oh, I did a lot this weekend. But nothing with pictures. At least not yet. Mostly what I have is a “honey do” list with a bunch of stuff crossed off. For instance, the border is up in the computer room! And the pictures and stuff are back on the walls. I’ve ordered a curtain and now all we need is a rug. What a great feeling it is to have that room back to normal. Which also means that the mud room is back to normal. As in, all the stuff that was in the mudroom until it could go back in the computer room is now back in the computer room. Woo and also hoo. Let’s see. What else did we cross off the list? The lawn is mowed. Cobblestones have been purchased for a new edge for an existing flower bed. The trim on the window and door by the deck has been painted. As have the stair risers coming off the deck. I’ve planned a week’s worth of meals, grocery shopped and prepped tonights’ dinner. A trip to the mall was made for a new cell phone for Hannah. It’s pink. She loves it. Did I mention that it’s pink? Lest you think that everything that needed to get done actually did get done – we didn’t get mulch, we didn’t get new glasses for Dale and some new undies for me, and we didn’t get to take our usual Sunday drive. As you may have noticed, most of the things that were accomplished were things that Dale had to do. (Have I ever told you about the division of labor in our household? Remind me to do that.) Mostly, all I had to do was supervise. Supervise meaning make sure that Dale doesn’t wander off and do things he’d rather be doing instead of things he’s supposed to be doing – the things on THE LIST. So, what’s a supervisor do while passing the time? Knit, of course. I made decent progress on the Shapely Shawlette. The color combination in this Koigu reminds me of the blooming lilacs in my yard right now. Don’t you think? Altho I’m impressed with the amount of work that was done around your house this weekend, I was more impressed with the flowers and the shawl. Great colors! Blooming lilacs have no equal in my book. Gorgeous shot! I had forgotten about that Shapely Shawlette pattern…saw them at MS&W last year. I’ll have to hunt it down now. Thanks for the reminder! The shawl is lovely and reminds me of the lilacs too. I can almost smell the lilacs! 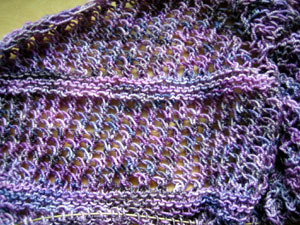 Fabulous shawl colors, and I can’t believe how much farther along your lilacs are than mine. Up here in the tundra, we’re just getting little leaflets. Lovely shawlette and of course the colorway is amazing. Don’t you just love Koigu? I’m with you. Monday mornings are most unwelcome here because I never get done what I want to get done on the weekend. So Monday mornings are more an exercise in disappointment here. Maybe there should be a third day to the weekend — two for working, one for lazy pancake breakfasts and drives in the country?! Your Koigu and flowers are beautiful! Even though there’s more to do, you did get a lot done. Our weekends are like that too — whirlwinds of games and birthday parties. Five days until NH . . . I *heart* your lilac. I’m such a poor gardener, I killed my lilac bush. How pathetic. They practically grow like weeks in my neighbors’ yards. Love all the purple! The shawlette is really pretty. Exactly how I feel………Monday, grrrr. So Monday morning and no underwear. Bummer! Lilacs are lovely, so’s the shawl. My lilacs are blooming now too. One of my long time most favoritest flowers! My thoughts exactly on waking up this morning…Monday!? How’d that happen? Your weekend was much more productive than mine. Your strategy is one I should start here…supervise and keep on eye on the one doing the work. That’s why my ‘suggestions’ are never acted upon! We also got a lot of yard work done this weekend. The previous owners took slates and placed them all around the perimiter of the house – as if they wanted to make a walkway, but were too lazy to make a ‘real’ walkway. So they were uneven, and broken, and hard to walk on. So Aaron and I picked them all up, and stacked them behind the shed. That’s been on my list since we moved in here a year ago! That picture of the kogiu and the shawl is wonderful. The Shapely Shawlette is just gorgeous! And the colors are a perfect match for the lilacs. And I’m right there with you with the Monday morning thing. Ugh!!! But it does sound like it was quite the productive weekend. Your shawl looks great and it does indeed go very well with the blooming lilacs! And I thought Monday just got here so quickly because Sunday was a drugged haze for me! The shawl is fabulous, and I can smell the lilacs from here. Mmmmmmm, I love the smell of lilacs. wow — that’s a lot of stuff done. joe and i were supposed to work on the yard and get rid of stuff that makes us look like hillbillies, but his father called. this happens a lot. i have a whole list of things that he’s done for his family but that i’m still waiting for. i’m not bitter. We sold our above-ground pool and our fish pond this weekend. I admit I will miss the fish a little, but they were more work than we were interested in doing. The pool I won’t miss at all! The shawlette is gorgeous as are those lilacs, purples rejoice!! Yay for the Honey-Do and especially that you got to supervise and knit! I would definitely like to hear how things are divvied up in your household. That Koigu shawl is Gooooorgeous! Supervising, huh? For some reason, The Boyfriend never lets me get away with that. The lilacs and the shawl are beautiful! I cut two large bunches of lilacs yesterday and a small bouquet of lily of the valley flowers. Would you believe that the LOTV overpowered the lilacs with their fragrance? We spent the weekend doing around the house stuff, too. It felt great to get all those silly little things that pile up out of the way. The lilacs and the shawl are just beautiful. That color combo is exactly right! But more importantly, it all looks good . . . and boy, you really were busy, huh?? SS looks good to me! Love lilacs…want to plant more…ours is a bit scraggly. 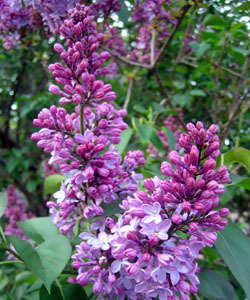 I love lilacs – grew up with my grandmother’s. She had six or seven HUGE bushes. The shawl and the lilacs are a perfect match. It’s almost like the yarn was spun from the lilacs. Oh, definitely the koigu = lilacs – purty! Underwear…now that’s a good thing to put on a list! Got the envelope in the mail on Sat, thank you so much! What a help! Mmmmm, I can smell those lilacs from here. Yummy. Lovely lace. I’ve been craving some lately. Well you may not have got everything you wanted done, but you got a good amount done, that’s for sure. Apparently I need to get some supervising tips from you so we get more done around here on the weekends!